Experience excerpts of the evening concert. With the selections and commentary geared to CCP’s younger patrons, these programs will be enjoyed by audiences of all ages. Burlington – Wednesday Afternoons at 4:00 p.m.
Hardwick – Thursdays Afternoons at 2:00 p.m. Okay, a confession: I’ve been to band camp. Several times. I am unquestionably a music nerd. Though I have never worn a T-shirt tucked into a pair of athletic shorts, was never a mouth breather, and never came to orchestra rehearsal dressed as a unicorn (like some of my peers), I did sacrifice large chunks of every weekend and several hours a week to practicing, lessons, and rehearsals. And, yes, I went to band camp. Band camp was a lot of fun. Classical music has a reputation for being boring, and there are rumors floating around that it’s only for old people. Not true! I loved classical music as a child, and I love it still, because, like band camp, it’s a lot of fun. I have vivid memories of attending the Craftsbury Chamber Players Mini-Concerts as a child. The concerts still happen every week in the summer, and are a free, kid-friendly preview to the ensemble’s longer, more formal evening concerts. Each week, my dad brought my younger sister and me to the UVM Recital Hall, and we’d settle in to listen to Mary Anthony Cox explain the finer points of music theory, history and technique. Then, we’d watch as the musicians played shorter excerpts of the pieces they’d play later, and we’d wait excitedly for the last piece, when the ensemble invited all the kids on stage to watch up close. As a budding music nerd, beginning violinist, and future trumpet player, I loved these summer afternoons. Now, I count them as some of the happiest parts of my childhood. Not only did I learn a lot, but the players, graduates of Juilliard and accomplished students of prestigious American and European conservatories, were great at interacting with the audience. They asked simple questions they knew we’d be able to answer, and delivered their knowledge to us in manageable bites. Not to mention letting a group of kids on stage with a baby grand piano. Do you know how cool it is to watch the innards of a piano while someone plays Chopin on it? Recently, I returned to the UVM Recital Hall on a Wednesday at 8 p.m. to attend one of the Craftsbury Chamber Players’ regular weekly concerts. The next week, I was back at 4:30 p.m. for their kids’ concert, ready to rediscover the musical joys of my youth. When I went, we learned about musical traditions, and the canon of French music. Cellist Fran Rowell taught the audience to listen for certain styles of playing in each of the three pieces, two of them demonstrating traditional influences and one of them deviating from the norm. Pianist Cox talked of her rigorous studies at the Paris Conservatory, which was founded by Louis XIV in 1669. It was as if I’d fallen into a Harry Potter pensieve full of my own childhood memories — it was almost exactly how I remembered. At earlier concerts, the musicians taught listeners about dynamics, displayed the athleticism that can go into playing an instrument, and demonstrated conducting techniques — even inviting a girl from the audience to conduct them all. Though their lectures, a cross between music lessons and program notes, are simplified for a younger crowd, their music is not. Single movements or excerpts of the pieces the chamber ensemble will play later in the evening speak to parents as much as to kids. 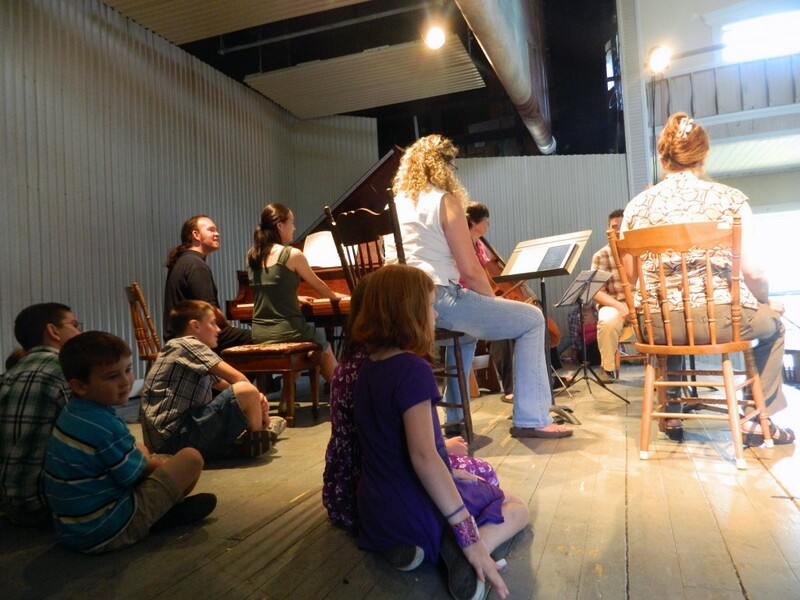 It’s a good solution for those who find themselves unable to attend formal concerts with antsy kids in tow; the music is still beautiful and kids are free to roam the aisles and even talk quietly without receiving dirty looks from other audience members. There are two concerts left this summer — one in Burlington, at the UVM Recital Hall on August 15, and one in Greensboro on August 16 — and I urge you to take advantage of this opportunity. Your kids might, as I did, find the joy in classical music. You might even have a young music nerd on your hands. And hey, coming from someone who’s been there, and done that, it’s a pretty wonderful thing to be.